In its 2017 listing of the “Best National Liberal Arts Colleges,” U.S. News & World Report has ranked Salem College as the No. 11 women’s college in the nation. In the same report of best liberal arts colleges in the U.S., among North Carolina-ranked schools Salem came in as the No. 2 liberal arts college and the No. 1 women’s college in the state. “While we know that colleges rise and fall in rankings depending on the study and methodology, Salem is consistently ranked one of the best women’s colleges in the country,” said Katherine Knapp Watts, vice president for enrollment, financial aid, and communications at Salem College. Overall, Salem was listed as No. 122 in the nation, which was a healthy fourteen-place jump from last year’s rankings. In a year of record-breaking enrollment figures, the new rankings highlight why Salem continues to attract some of the best and brightest young women from throughout the United States. “Following the news that Salem College just announced the largest first-year enrollment in our 244-year history, we are especially pleased that U.S. News & World Report rankings put us as the No. 2 liberal arts college in North Carolina, the No. 1 women’s college in North Carolina, and among the top 11 women’s colleges in the U.S.,” Knapp Watts said. Salem’s category of National Liberal Arts Colleges includes only institutions which focus almost exclusively on undergraduate education, which award at least 50 percent of their degrees in the arts and sciences. To rank colleges and universities for the Best Colleges 2017 guidebook, U.S. News & World Report assigns institutions to categories developed by the Carnegie Foundation for the Advancement of Teaching. Contributing to part of Salem’s success in this year’s rankings was the college's small and intimate nature of classes including the fact that 87.8 percent of Salem classes have fewer than 20 students and the overall student-faculty ratio is 11:1. The rankings in the Best Colleges 2017 guidebook are based on data U.S. News & World Report collects directly from colleges and universities, as well as from other sources. The magazine reported that 93.5 percent of the 1,374 colleges and universities it surveyed responded to its request for statistical information. 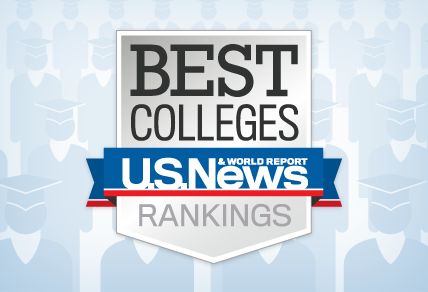 Complete U.S. News & World Report rankings are available at www.usnews.com/colleges. Salem has performed exceptionally well in a variety of other recent national rankings. Late last month Salem was ranked in the Top 30 of all liberal arts colleges in the U.S. and placed fifth in the “Best Bang for the Buck” colleges in the southeast by Washington Monthly magazine’s 2016 College Rankings. CollegeChoice.net also named Salem as a Top 10 Most Affordable Master’s in Counseling programs in the nation and USA Today recently named Salem as one of the Top 10 Best Colleges in North Carolina, along with Duke and Wake Forest universities.